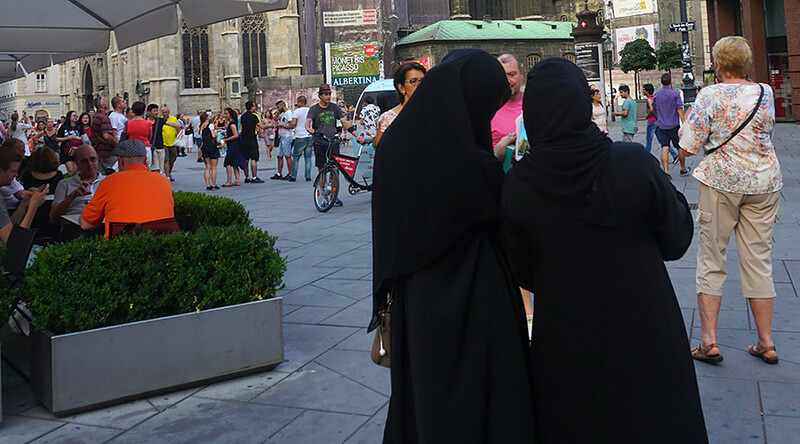 Austria’s controversial ban on the wearing of Islamic face veils in public places came into effect Sunday. Those found in breach of the ‘Anti-Face-Veiling Act’ will be subject to fines of €150. The country approved the ban on face veils back in May as part of a wider ‘integration law’ which, according to officials, is aimed at encouraging people to assimilate into Austrian culture. “Acceptance and respect of Austrian values are basic conditions for successful cohabitation between the majority Austrian population and people from third countries living in Austria,” the government has stated, according to AFP. Authorities claim the act is “religiously neutral,” with other forms of face covering also prohibited. People caught wearing off-slope ski masks, surgical masks outside hospitals and party masks/make-up could also be subjected to a fine. The law does exempt people who cover their faces for medical or safety reasons, including hazardous weather conditions such as smog. Participants of street carnivals and other “artistic, cultural or traditional events” are also exempt, along with athletes requiring face-covering gear. “Whoever wears [a] niqab or burqa in Austria has to deal with the consequence,” said Austria’s Foreign Minister, Sebastian Kurz, who was instrumental in drafting the law, as cited by Reuters. The Austrian Islamic Religious Community (AIRC) has said they are “strongly opposed” to the ban and that it is not conducive to integration, reports RTL. “This open society is, in a hypocritical way, endangering its own values,” Carla Amina Bhagajati of the AIRC said, adding that in Vienna only a “handful” of women will be affected. Those that are, she said, are now “criminalized and… restricted to their homes,” according to AP. French-Algerian businessman, Rachid Nekkaz, has promised to pay any fines incurred by Muslim women choosing to wear the veil. Nekkaz already pays fines for Muslim women wearing face veils in other European countries. He even established a special organization called “Touche pas à ma constitution” (Do not touch my constitution) that settles these bills. With an election in Austria scheduled for October 15, immigration is an important topic for leading parties. The anti-immigration Freedom Party (FPÖ) are expected to place second or third, potentially forming a government with the conservative Austrian People’s Party (OVP), ousting the Social Democratic Party, the current leading coalition partner. OVP, headed up by Kurz, has drawn voters from the FPÖ with his anti-immigration rhetoric. “The immigration seen in recent years is changing our country not in a positive but in a negative way,” Kurz told German television earlier this week, according to AFP.